Lightly Citrus Quaffable pale ale. Harley draws its name from Edward Harley, ‘The Great Collector’. He was husband to Henrietta, and one of the country’s finest archivists, building an astonishing collection of books and art at Welbeck. 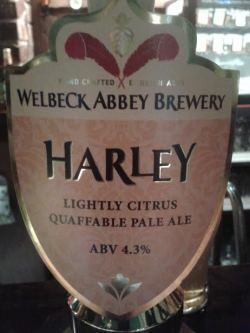 Harley is a lightly citrus, refreshing pale ale, crafted using a balance of English, German and American hops. UPDATED: MAR 23, 2019 Cask in Spencer's in Retford. Amber with a white head. The taste is toast and citrus. Quite fruity for what it is. Thin and watery. UPDATED: AUG 8, 2018 Pours a clear light amber colour with a small bubbly off white head. Aroma is malty, some caramel and citrusy fruit. Moderately sweet malt taste, some red fruit flavours and a pleasant bitterness. Long bone dry finish, a bit watery but a pleasant drop. Cask conditioned at The Beerd, Oxford. Gold with white head. There is a sweetish, fruity character to this with a light raspberry hint. Fullish on the palate, bubblegum later, some floral notes. Pretty decent. Draft - pale yellow with small white head, clear. Decent aroma with good mouthfeel. Pleasant tasting, slight citrus tang - good finish. 500ml bottle at home on 25 Nov 2016, from Glen Park Hotel, Ayr (bb 31 Jan 2017), weak floral, citrus aroma, golden amber with no head, orange, caramel, earthy, flat, oily. Bottle from Glen Park Hotel, Ayr. Appearance - golden with a decent head. Nose - earthy and savoury. Kitchen smells? Then red fruits. Taste - caramel biscuits. Red fruits again. Palate - light tomedium bodied with a creamy yet crunchy texture and a long dry finish. Overall - yeah good ale. Not a golden ale. It’s a bitter. Cask. Portland House, Sheffield. Clear gold. Thin, dense, sticky, white head. Fruity malts. Soft, citric hop. Some bready, yeasty notes. Taste is privet leaf bitter. Malt sweetness. Light body. Grassy bitter finish. Ok.
Cask at The Roebuck, Leek (Titanic) A clear pale amber colour with a medium white head. Aroma of orange, pepper, slight pale malts and grassy, herbal hops. Taste of orange, a hint of grapefruit, some pepper, slight straw and grassy, herbal hops. Light bodied and soft carbonation. A dry, grassy, herbal hop bitterness in the finish. A nice and simple golden ale that’s crisp and refreshing. Decent.